New York, NY – Thursday, May 12, A Grand Alliance to Save Our Public Postal Service, a coalition of 130 organizations, met at St. Mary’s Episcopal Church in Harlem, and held a hearing in front of a wide range of politicians and activists. Introductory remarks by moderator Nellie Bailey stressed that “our public good must not be sacrificed for the profit of private investment,” and privatization was a key concern in much of the testimony that followed. James Parrott said that some Washington officials were seeking to privatize the post office, and that this effort underlay the oft-promoted fallacy that it is losing money. In 2006, Congress required the Postal Service to pre-fund retiree healthcare costs 75 years into the future at a cost of approximately $5.5 billion annually, thus laying the groundwork for financial instability. Mariam Sammons, whose organization Visiting Neighbors helps seniors in New York City, talked about their fear of privatization of the service, as the post office has many important roles in seniors’ lives, among them the dependable delivery of medications and medical supplies. Julio Pabon spoke of the manufactured financial crisis and how it functions to “weaken the Postal Service” and serves as “an excuse for cutbacks.” Small business owners can suffer “devastating” losses when a neighborhood post office closes, he added. 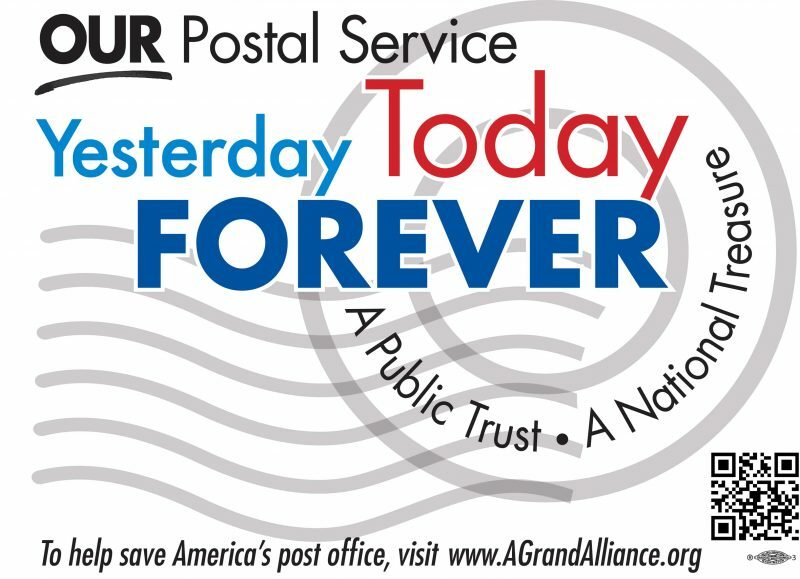 A central tenet of the Grand Alliance is that rather than cutbacks, the Postal Service should seek to expand its services, in such areas as postal banking – an idea advocated by presidential candidate Bernie Sanders among others — especially in underserved communities, which are mostly communities of color. The services would range from paycheck cashing and bill payment to savings accounts and small dollar loans…. This entry was posted in Downsizing USPS, General Union Business, User Submitted and tagged A Grand Alliance to Save Our Public Postal Service, Chuck Zlatkin, fight privatization, NY Metro Area Postal Union, save jobs, Save The Postal Service, union jobs. Bookmark the permalink.